MicroLED is a display technology that employs microscopic-sized LEDs that, when arranged across a video screen surface, can produce a viewable image. Each MicroLED is a pixel that emits its own light, produces the image, and adds the color. A MicroLED pixel is made up of red, green, and blue elements (referred to as subpixels). MicroLED technology is similar to that used in OLED TVs and some PC monitors, portable and wearable devices. OLED pixels also produce their own light, image, and color. However, although OLED technology displays excellent quality images, it uses organic materials, whereas MicroLED is inorganic. As a result, OLED image producing capability decays over time and is susceptible to "burn-in" when static images are displayed for long periods of time. MicroLEDs are also different than LEDs currently used in LCD TVs and most PC monitors. The LEDs used in these products, and similar video displays, don't actually produce the image. Instead, they are small light bulbs placed behind the screen, or along the edges of the screen, that pass light through LCD pixels containing the image information, with the color added as the light passes through additional red, green, and blue filters before reaching the screen surface. MicroLED pixels don't degrade over time and are less susceptible to image persistence, not subject to burn-in, which are limitations with OLED. They are also brighter than OLED pixels - on par with LED/LCD pixel brightness capability, but just as capable as OLED in displaying absolute black and equivalent levels of color saturation. Supports low-latency and faster refresh rates without depending on frame interpolation, black frame insertion, or backlight scanning (Good news for gamers!). Wider viewing angle than current LED/LCD technology can provide. Lower power consumption than LED/LCD and OLED technology, when comparing equivalent screen size. MicroLED supports modulator construction. TVs, PC monitors, and video displays are usually made using a single panel, and a movie screen is usually one sheet of fabric. However, a MicroLED display can be assembled from smaller modules to create any needed screen size. This is well-suited for commercial applications, such as large digital signage displays (like outdoor screens used in Las Vegas, or scoreboards and video displays used in arenas and stadiums), or as a video projector/screen replacement in movie theaters. Not currently available for smaller consumer wearable, portable, TV or PC monitor screen sizes that need high resolutions. When using modular construction, only wall mount installation may be supported for larger screen applications. Although the goal is to make MicroLED available to consumers, it is currently limited to commercial applications. Samsung Cinema Screen - Samsung's Cinema Screen ​(also referred to as an Onyx Screen) utilizes MicroLED modules to assemble large size screens required by movie theaters, eliminating the need for a traditional projector/screen setup. 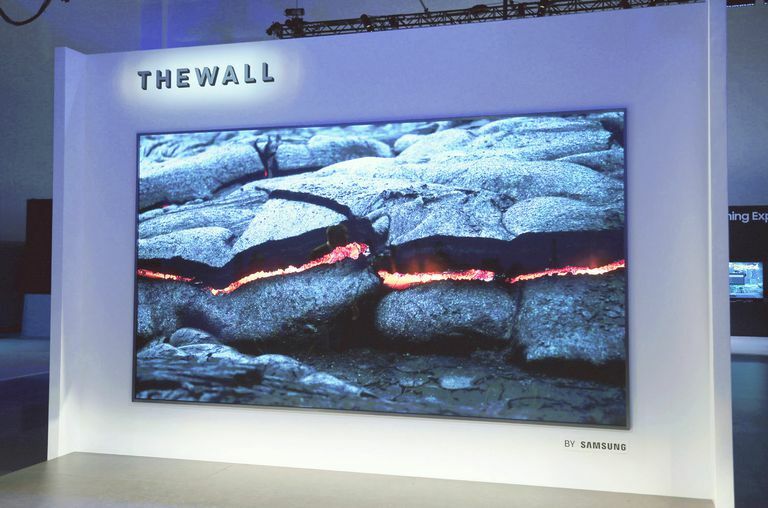 Cinema Screen is brighter, can display higher resolutions, and is 3D compatible.Cinema Screens have been installed in select movie theaters in South Korea, China, Thailand, Switzerland - and now, the U.S.
Samsung's tentative consumer version of Cinema Screen is referred to as ​"The Wall", which displays 4K resolution on a 146-inch screen. Sony CLEDIS - CLEDIS stands for (Crystal LED Integrated System or Structure).Sony is implementing its variation of MicroLED in digital signage applications. There are a lot of bright outdoor video displays, as well as in shopping malls, arenas, and stadiums. However, the LEDs used in those displays are not much smaller than LED Christmas lights you might use at home. As a result, you can often see the LED structure of the screens making them irritating after viewing them briefly. Using much smaller MicroLEDs, Sony's CLEDIS approach results in a smoother "TV like" viewing experience for outdoor and large venue settings. MicroLED holds a lot of promise for the future of video displays. It provides long life with no burn-in, high light output, no backlight system required, and each pixel can be turned on and off allowing display of absolute black, erasing any limitations of both OLED and LCD video display technology. Also, support for modular construction is practical as smaller modules are easier to make and ship, and easily assembled to create a large screen. On the downside, MicroLED is currently limited to very large screen applications. Although already microscopic, current MicroLED pixels aren't small enough to provide 1080p and 4K resolution in common TV and PC monitor screen sizes used by consumers. In its current state of implementation, a diagonal screen size of about 145 to 220 inches is required to display a 4K resolution image. That being said, Apple is making a concerted effort to incorporate MicroLEDs into portable and wearable devices, such as mobile phones and smartwatches. However, shrinking the size of MicroLED pixels so that smaller screen devices can display a viewable image, while cost-effectively mass-producing the small screens is definitely a challenge. If Apple succeeds, you may see MicroLED flourish across all screen size applications, replacing both OLED and LCD technologies.